Paul Donovan grew up playing on sacks of sugar. As the son of a confectioner, his life was all about lollies … until he got older, realising his business was affecting his health. With his wife and business partner Lea, he decided to make the drastic move to get out of the lolly business and focus on creating foods that benefited people’s health. Paul and Lea sold the family confectionery business and launched Googys, a natural real food protein bar company based in Melbourne. But when Paul started to get sick all the time, he did not immediately make the connection between the sugar he was consuming and the steady stream of colds and lack of energy. “I just thought it was because I was getting older and was working hard,” Paul said. “How could lollies be bad for you – they are low in fat, a special treat and make people happy? For Paul and Lea, this moment changed the course of their business. They started investigating different ways to get their health back on track. From cleansing diets to juicing diets, boot camps to supplements, nothing stuck long term. “While we were researching ways to get healthier, we discovered eating clean and real food are simple and sustainable ways to lose weight and get healthy,” Lea said. Still a family business but now creating a range of products they can be proud of. With decades of experience in manufacturing, going from lollies to real food protein bars and pancake mixes, was not a massive change in how they ran the business; only the ingredients changed. For Paul and Lea, it was important the protein bars were not filled with artificial products but real food. Their simple ingredients product list, shown right on the front label, is testament to this with no more than seven ingredients in each bar. 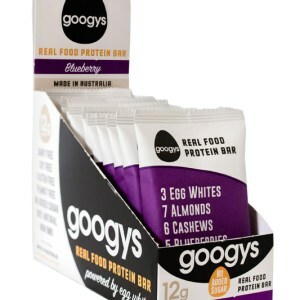 What makes Googys different to many other health products on the market is their sole focus is on creating real food, unlike many multinationals who make their ‘health’ products at the same facilities as their confectionery. Paul said Googys is a passionate small family business. “We make everything ourselves and stand behind our product. We want to see others make the shift to a healthy diet and lifestyle,” he said. The main ingredient in a Googys bar are egg whites. Lea said when they were researching the best source of protein that was a real food, this was the winner. “Eggs are the real deal as nutritional powerhouses. Egg whites naturally contain very high levels of protein that has the most bio available fit for human digestion and absorption compared to other proteins,” she said. A Googys bar is as clean as you can get because Paul and Lea were adamant there was no chemical extraction processes or solvents to “isolate” or “concentrate” the protein like many dairy and vegetable sources use. “We use a gentle drying that also pasteurises the egg whites, making them perfectly safe to eat,” Paul said.